Naples is known for its large, all-ages, master-planned communities. But, there are plenty of 55+ options steeped in luxury. Active adults looking for a place for their Florida retirement have a number of excellent reasons to choose Naples. There are great beaches, lots of luxury, and plenty of culture and recreation. There’s also some of the cleanest air in the country, according to the American Lung Association. Naples, Florida real estate offers a lot of options. There are master-planned neighborhoods and communities without age restrictions so entire families can live together. The area also features housing with age restrictions. Buyers who appreciate the benefits of a 55+ community will want to consider these options. At Riviera Golf Estates in Naples, residents enjoy a social and active lifestyle with plenty of opportunities for golf. The 18-hole course is pay-per-play, so no club memberships are required. The clubhouse in this 55+ community includes a library, fitness center, and a studio for arts and crafts. There’s an outdoor pool and spa as well as two satellite pools, shuffleboard courts, and space for tennis and pickleball. The community is comprised of 700 single-family homes and condos in two-story buildings. The condos have two bedrooms, two bathrooms, and between 1,025 to 1,700 square feet. The single-family homes are between 672 and 2,158 square feet and have two or three bedrooms, and many come with attached two-car garages. 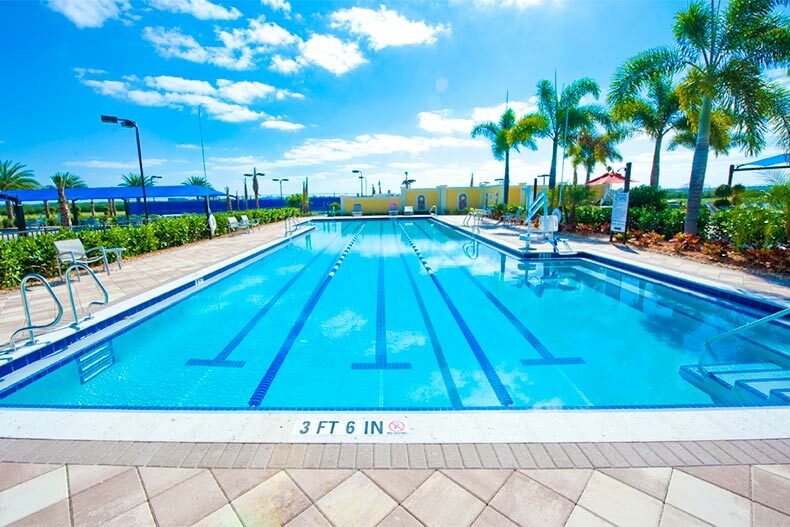 Located within the master-planned community of Ave Maria, Del Webb Naples is the perfect place for active adults who want the feel of a small town. Residents can wander around the town square and take a class at Ave Maria University. The Oasis Club is an amenity center dedicated to the 55+ community, and includes a catering kitchen, continuing education center, a lap pool, and courts for tennis, pickleball, and bocce. Optional golf memberships are available at Panther Run Golf Club, which has 18 well-landscaped holes, a practice facility, and a restaurant. New and resale attached villas and single-family homes are available in models that have between two and four bedrooms, most with dens. They range in size from 1,157 to 2,852 square feet. Residents who want to mingle with other age groups only need to visit the town square to do some shopping and dining out. Another scenic 55+ community with golf available is Carousel Cove at Bonita Fairways. It’s an intimate neighborhood with only 105 single-family homes for active adults who value amenities and location. Residents never feel like it’s too small, however, because Carousel Cove is part of the larger Bonita Fairways master-planned community. There’s always a reason to gather at the 19,000 square-foot clubhouse, whether it’s to use the fitness center or attend a casino night. There’s shuffleboard and tennis, as well as miles of walking and biking paths. The 18-hole executive golf course is perfect for daily or occasional play. Many of the resale homes have views of the golf course. Properties range in size from 865 to 2,152 square feet with either two or three bedrooms and two bathrooms. Buyers also have an attached two-car garage and easy proximity to things like grocery stores, restaurants, and retailers. Bonita Springs is close to Naples and has some unique beaches. Lovers Key State Park is perfect for kayaking and manatee watching, and Little Hickory Island Beach Park is a favorite for families and picnickers. Another Bonita Springs 55+ community that’s perfect for sun-seeking active adults is Valencia Bonita. It offers some of the most desirable homes for sale in Naples. Imagine having a Roman tub in your master bath, a walk-in pantry in your kitchen, and a separate club room for games and entertaining. You can find all of those in the new home models at Valencia Bonita. With two or three bedrooms and dens, up to three-and-a-half bathrooms, and between 1,738 and 3,350 square feet, these single-family and attached homes are for buyers who insist on quality and comfort. Amenities in Valencia Bonita include a 45,000 square-foot clubhouse, which is under construction. It will have a fitness studio, grand ballroom, and a studio for arts and crafts. Residents will enjoy the sports lounge and the cafes and bars that have indoor and outdoor seating. A resort-style pool is planned as well as a resistance pool, a lap pool, and a wading pool. Residents can spend time outside playing basketball, tennis, pickleball, or enjoying the dog park and the fire pit. Farther north of Naples, towards Fort Myers is the beach town of Estero, and a favorite 55+ community in that area is Cascades at Estero. It has 614 single-family homes in an enviable Lee County location, with ample beaches and golf courses in the area. These homes have two or three bedrooms and dens, and there are numerous floor plans available to meet most lifestyle needs, whether it’s a gourmet kitchen or a remodeled master suite. Homes are between 1,525 and 2,536 square feet. Cascades at Estero is socially active and friendly. The community has its own newsletter and television channel. A full-time activities director helps with planning events and social engagements. Residents keep busy with clubs like quilting, bingo, and billiards. There’s a clubhouse, a fitness center, a ballroom, and several spaces for cards and games. Outdoors, there’s a covered veranda, a large pool, and courts for tennis and bocce ball. Tidewater by Del Webb is a new 55+ community in Estero and features single-family homes and attached villas. Buyers can choose from eight spacious models that offer enticing features like open floor plans, huge master suites, and upscale fixtures. The Serenity model starts at 1,542 square feet, with two bedrooms and a den. The largest model is Stonewater with three or four bedrooms and 2,852 square feet. Residents will have no trouble staying active at Tidewater by Del Webb. The fitness center in the clubhouse includes a movement studio, and there’s a library and a catering kitchen. Outside, there’s a resort-style pool and a barefoot bar. Residents can play tennis or pickleball. Estero offers a lot of recreational opportunities, including Estero Bay Preserve State Park, which features hiking trails, wildlife, and a shallow inlet that’s perfect for snorkeling and shelling.